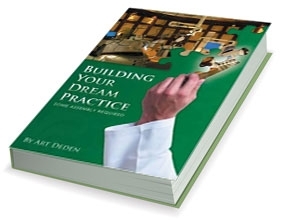 Building Your Dream Practice: Some Assembly Required. You want solutions not motivational rants, hope not hype, systems not sizzle. Hundreds of dentists told us that they did not fit into the “one size fits all” box that many practice management programs offer. Dentist after dentist told us that they were tired of the content being “pushed” and had outgrown those “worn” methods both intellectually and emotionally. Vista Practice Management was created as a result of listening to what dentists need most. Especially in these hard economic times, your reputation is the greatest asset you have. Patients talk. You never want to be compared to a car salesman who uses scripts to get what he wants. Patients can smell the sell and no one likes to be sold! A dental practice is a small business with huge potential, few would argue with that. But far too often dentists buy into the latest fads and “bandwagon” programs. If you are going to reach your goals you can’t be learning “yesterday’s” techniques. Whether you are looking for help in one or more areas of your practice, or, if you are looking for a complete “customized” program, we have what it takes to meet your needs.